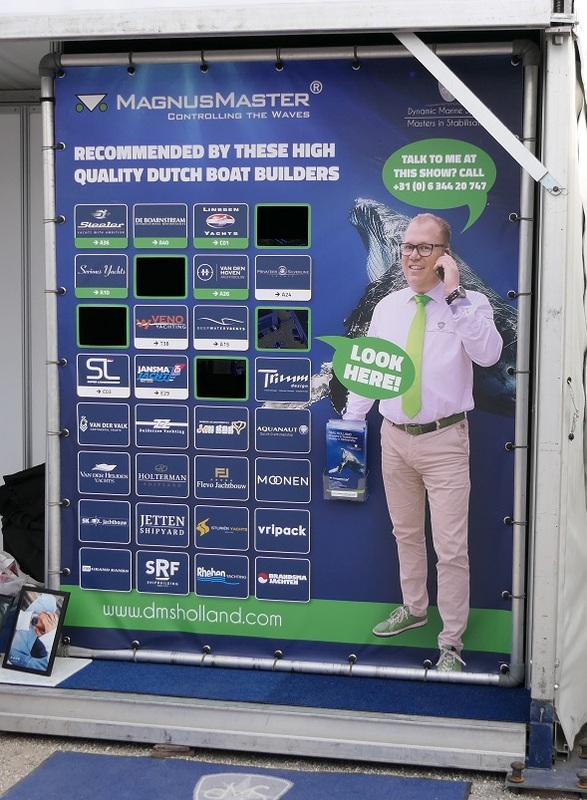 During the recent Hiswa-In-Water-boat-show, Europe’s biggest in-water exhibition, DMS Holland followed a completely different course. This year DMS Holland did not have a manned-stand with a demonstration model of a roll damping system on display. 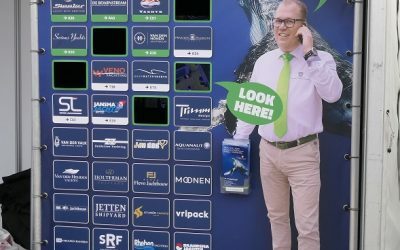 Instead there was an interactive presentation wall on which the logos of the shipyards to which DMS Holland supplies the MagnusMaster system and a film with testimonials could be seen. The reactions from the shipyards were great. “We are very pleased with the support we receive from our stabiliser supplier DMS Holland. This company really understands how a collaboration between a shipyard and supplier should be. They are revolutionary not only in their product, but also in how they showcase their company to the market. That is why they are also the first to have an unmanned stand at a maritime show like this”, explains Hans Webbink of Steeler Yachts. In addition to the presentation wall MagnusMaster was also promoted by 10 exhibiting shipyards. In support of this, DMS Holland had provided them with, in addition to personalised brochure material in two languages, a MagnusMaster / DMS Holland banner with an image of one of their yachts and the logo of the respective yard. Furthermore, amongst the demonstration vessels at the show, the following were equipped with a MagnusMaster roll damping system: Boarncruiser Elegance 1500 – CS, Boarncruiser 1360 Elegance – Sedan, Steeler NG 50, Bart van den Hoven Executive 1850, Serious Yachts Brightly 1530 and Linssen 40.0 Sedan. And of course, don’t think for one moment that Patrick Noor was not at the show himself. “DMS Holland is coming to you this Hiswa” was the motto. For visitors who were interested in the MagnusMaster system, he was mobile and available (on his mobile! ), meeting visitors at their location of choice, for example, on a stand or onboard. Wherever he was needed he was there to provide brochure information and further details. “The end result of this in-water event is turning out to be the best so far since DMS Holland started up 5 years ago. It is estimated that we will have certainly sold more than 10 systems for both existing boats and for newbuilds. With 10 sales outlets across the show that works out on average at more than 1 system per location, which of course is a fantastic result.” confirms Patrick Noor.